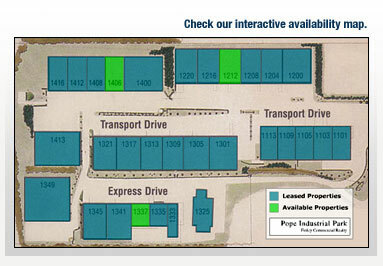 Pope Industrial park is one of the area’s largest industrial/warehouse parks in North Carolina. We offer outstanding property features backed with superior services. The park’s features include insulated walls; 1624 foot ceilings; multiphase power; propane gas-heated warehouse space; air conditioned office space; dock-height, drive-in doors; and sprinkler systems throughout. With responsive management, excellent features and a great location, Pope Industrial park is the perfect site for your business.